Ableton Loop in its second year was a vastly expanded event, with more people, more interactions, and a greater sense of community. And it was more hands-on. The workshop with Skinnerbox, the duo that makes such robust use of Live, well, live, was overflowing. But now there’s a gift for everybody, not just those lucky enough to pack into the Berlin session. Curve does what it sounds like – take a MIDI input, map to a curve. It really ought to be part of Ableton’s native MIDI mapping functions, but until Ableton does (cough), it’s a great Max for Live tutorial. CURVE by SKINNERBOX is a follow up device to our workshop during ableton loop 2016. simply map a midi controller to “MIDI IN” and use the mapping controls to map the incoming signal to any parameter within live. the “CURVE” parameter allows you to apply a logarithmic / exponential curve to the incoming signal and thus make the most out of your controller and add some “musical” precision. values less then 1. will produce a logarithmic curve whereas values more then 1. will produce an exponential curve. 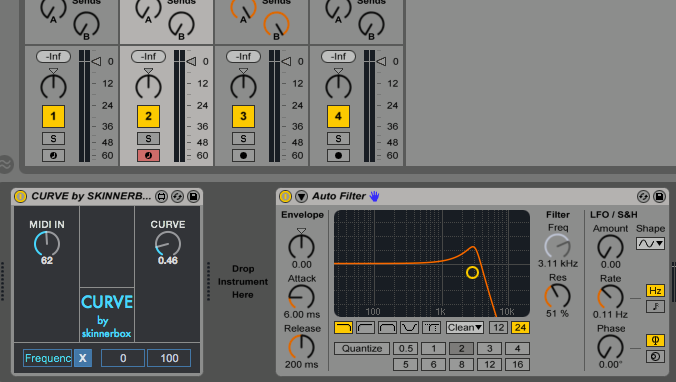 Addendum: If what you want to do is do more complicated mappings, including curves, check out the mapping patches in the free Max for Live Essentials pack from Ableton. What’s nice about this Curve patch is, because it’s so simple, it’s probably a better starting point for learning to create your own Max patches for processing MIDI.